Magdalene Christine Lazzar passed peacefully at home in the arms of her family on April 2, 2016. Born on March 28, 2016, Maggie had weight in this world…3 lbs 14 oz to be exact. She brought immense joy to every life she touched during her brief five days on Earth. Maggie is the daughter of Peter and Christine Lazzar, sister of Luke and Noah. She is celebrated by maternal grandparents Ronald and Marilyn Yorick and paternal grandmother Marjorie Lazzar. She is preceded in death by paternal grandfather Edward Lazzar, who is now holding her gently in heaven. Maggie is also celebrated by several aunts, uncles, cousins, and friends. A Memorial Mass will be celebrated on Friday, April 8th at 10am at St. Monica Parish, 160 E. Silver Spring Drive in Whitefish Bay with visitation at 9am. Interment following at Resurrection Cemetery in Mequon. If anyone would like to make a donation in Samuel’s memory, please donate to “Now I Lay Me Down To Sleep” infant bereavement photography at http://www.nilmdts.org . David Henry Banke Funeral services for David Henry Banke, infant son, will be held at 12 noon today, at Willow Creek Community Church, South Barrington. 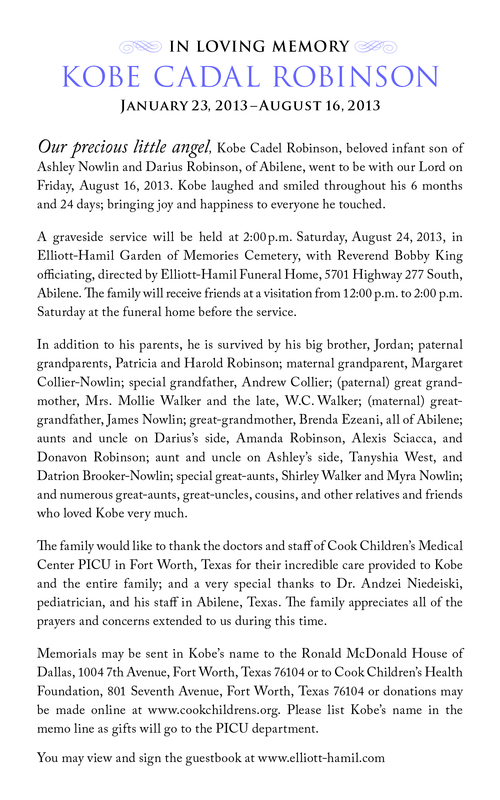 Visitation will be from 11 a.m. until the time of services. He passed away Oct. 30, 2008. David was the son of David and Natasha Banke of (city); brother of (sister); and grandson of david’s parents (city) , Natasha’s parents (city). Omission of flowers and gifts are requested. Memorials may be made to the family for a future bereavement fund. Laird Funeral Home, Elgin,( phone number), is in charge of arrangements. Cole Edward Gene Cremer, newborn son of David and _____ Cremer, St. Joseph, died Wednesday, February 8, 1995, at a St. Joseph hospital. He was preceded in death by his maternal grandfather, Herman Crumb, and his maternal great-grandfather, James Castle. Additional survivors: a sister, Charlotte of the home; a half sister, Diana, Kingman, Ariz.; a foster brother, Scott of the home; his maternal grandmother, Charlotte Crumb, Amazonia, Mo. ; his paternal grandparents George and Ellen Cremer, Kingman; and his maternal great-grandmother, Geraldene Castle, Stewartsville, Mo. Graveside service and burial: 11 a.m. Monday, Memorial Park Cemetery, St. Joseph. Family visitation: 6 to 8 p.m. Sunday, Heaton-Bowman-Smith & Sidenfaden Chapel, St. Joseph, where friends may call after noon Sunday.